Monday and Tuesday went pretty smoothly, and today was okay, too. It's almost the "unofficial start of summer", and you're feeling like a little post- work debauchery, but you know just what to do. Hit your favorite watering hole for drinks with your crew. Don't forget to wear a pair of heels that'll have all eyes on you. A pair like these Firefly Pumps from Rupert Sanderson will be perfect! 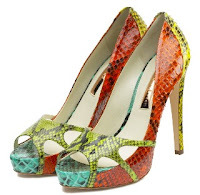 If it's not because the of the multi-colored python, then 4 3/4 inch heel and slight platform will make you tall enough to catch an eye or two. Doesn't the word "firefly" conjure images of sitting on the porch, lemonade in hand, watching the little bugs light up? 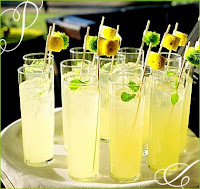 Well, we've found a drink that sums it all up in one sip: The Firefly Vodka Lowcountry Lemonade (Recipe & image from www.hostessblog.com). The recipe calls for Firefly Lemon Tea Vodka (yes, the vodka is actually infused with lemon sweet tea! ), fresh lemonade, and lemon slices. It's got a sweet/ tart taste, but it definitely packs a punch. Just make sure you imbibe responsibly. Wouldn't want to scuff your shoes!